Eddie Griffin Enzo Bumper Lives On As LeMons BMW Wing, Could Be Yours! Remember the Eddie Griffin Wrecked Enzo? 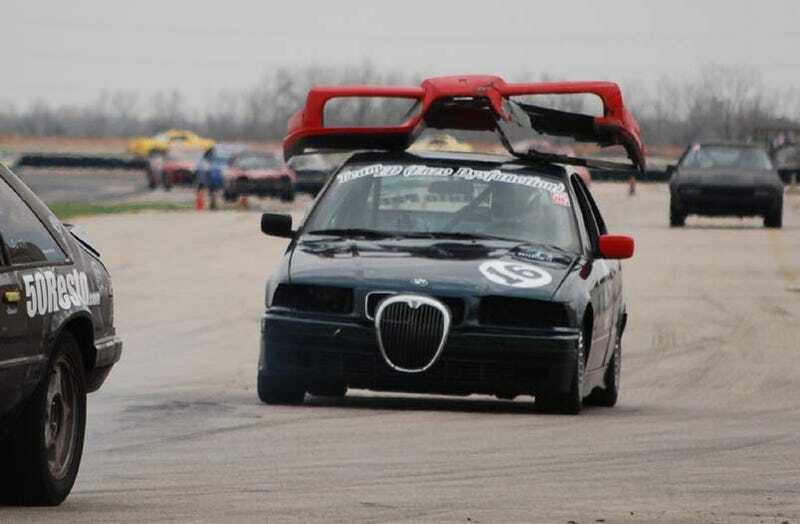 The carbon-fiber bumper from Eddie's Enzo now lives on as a performance-enhancing aerodynamic device on the Enzo Dysfunction BMW E36 at the 24 Hours Of LeMons Texas! Matt Groner, the guy who restored the once-bashed Enzo is also a 24 Hours Of LeMons racer. This race, he's running a 1995 BMW E36 (obtained via salvage title, which didn't stop the Chief Perp from slapping a 100-lap BS Penalty on it), and he decided it would look much better with the beat-up original carbon-fiber bumper from the Enzo bolted to its roof. Remember the Ferrari Enzo wrecked by Eddie Griffin last year? After a few hours, however, the safety enforcers at MSR decided that Team Enzo Dysfunction's "wing" wasn't the safest accessory they'd ever seen, so off it came. Even so, this Hollywood-famous and LeMons-veteran object is still available for purchase on eBay, with all proceeds going to charity. Wall art? Part of a body kit on your Diamante? It's up to you!